J&K Students marching ahead in life. 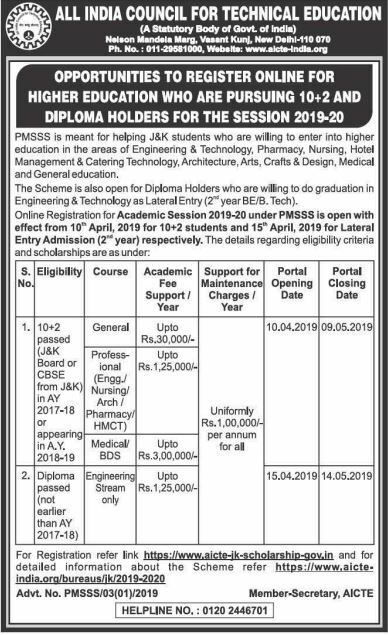 J & K Cell deals with Implementation of Prime Ministers Special Scholarship Scheme to J&K Students to pursue undergraduate studies outside the State of Jammu and Kashmir. The J & K cell is responsible for proper implementation of the scheme to fulfil the objectives of Prime Ministers Special Scholarship Scheme to J&K Students. For any kind of Queries/Complaints may contact 0120-244-6701. Evolving guidelines for proper implementation of the scheme to fulfil the objectives. To Conduct Awareness Workshops about the Scheme. To Conduct Counselling for admission of candidates to different programs/courses. Disbursal of Scholarship for the eligible Candidates. Redressal of Grievances of PMSSS Candidates.